At Cruise Shipping Miami 2011, Sebastian Ahrens, managing director of Hapag-Lloyd Cruises, made a significant contribution to the discussions on ultra-luxury cruising today with these comments. In the years beyond 2010 Mr Ahrens describes the cruise market as having become a mass market phenomenon, but with the onset of the affluent baby boom ultra-luxury forms of travel are emerging that are becoming significant volume markets in their own right. Tied to this is the advent of an age of “non-ostentation” compared to earlier years, when luxury cruising had often been a means of showing off. Younger people entering the market today tend to think differently. People are more interested in health, space, experience, authenticity, individuality and sustainability, as well as that most valued of commodities, time. Superficialty, ostentation, excess, noise and status are now giving way to enlightenment, authenticity, conscientiousness, discretion and symbolism. More intelligent approaches are expected rather than sales and hype. Mr Ahrens also outlined Hapag-Lloyd’s new Europa 2 product, to be introduced in the spring of 2013. Her cruises will not be as long as offered in the past by earlier Europa’s, but will be offered instead in 7-day segments that can also be taken as 14-day or 21-day vacations, with the ship triangulating on three ports, say Barcelona, Monte Carlo and Valletta in the western Mediterranean, or Venice, Athens and Istanbul in the eastern Med, with 7-day sectors offered between turnaround ports that repeat. As to the ship itself, in addition to more verandahs and premium and spa suites, Hapag-Lloyd Cruises will pay more attention to the children of the affluent. While parents will be able to make their own “private arrangements” around their cruise holidays, children will now be attracted by a new brand co-operation with Steiff, the world’s oldest maker of teddy bears, and a new bear, Captain Knopf, will be introduced to take advantage of this. Not only that, but the bears will be backed up by a program of children’s books. On board, children will be looked after in three different age groups, something quite different from what was offered in previous ships that carried the name Europa. The Europa 2 will have seven plus one service restaurants, including a sushi bar, and free seating with open timing. And no extra tariff will be charged at any of the ship’s restaurants. This will be backed up by authentic culinary events. Entertainment will consist of a mix of production shows, solo artists and theatre and the music and talks on board, as well as the decoration (by Partner Ship Design) will be more contemporary in nature. In addition, the new ship will concentrate on fitness and wellness and there will be a broad range of interactive services, television, video, music, news, internet and services for information and reservations, all provided in cooperation with Siemens Media4Cruise. Finally, in the winter time the Europa 2 will not perform world cruises, but shorter voyages in warm waters, for instance the Far East. The present Europa will meanwhile continue her program of world cruises for the ultra-luxury market while the Columbus 2, presently sailing as the Insignia, will look after the premium market. 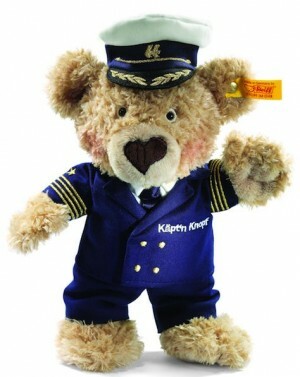 Images courtesy of Hapag-Lloyd Cruises and Steiff.